In a review cycle, a manager may want to change the scores given to an employee after they have already completed their review. Follow the steps below to re-open scores for a manager. 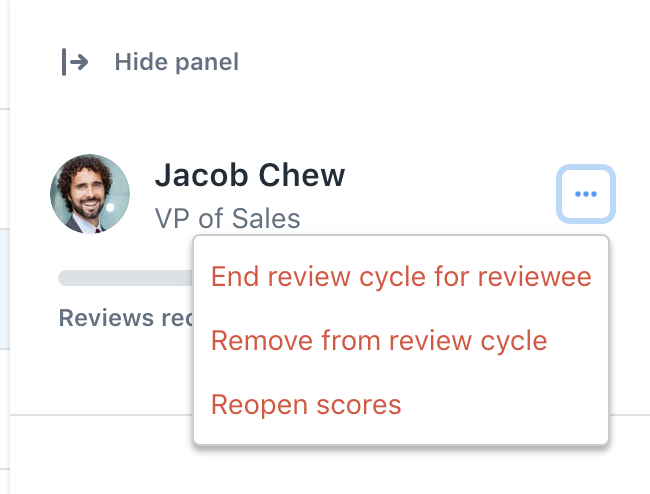 Step 4: If the review cycle is closed, you will need to re-open the reviewee by clicking on the "..." next to their name and selecting "Reopen reviews for reviewee" from the dropdown menu. Please note that this will only be required if the full review cycle is closed, or if the cycle was closed for that employee. If the review cycle is active, you will skip this step.